Also known as "Grolsch Style Bottles" "Latch Lid Bottles" "Air Tight Bottles" "Flipper Bottles" "Hermetic Swing Top Bottles" "Seal Tight Swing Top Bottles" and more! Great Swing Top Glass Bottles for Storing, Preserving and Displaying: Wines, Oils, Vinegars, Limoncello, Liquors, Liqueurs, Syrups and more! They Make Wonderful Gifts For: Holidays, Weddings, Birthdays and more! 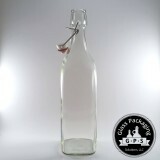 These swing top glass bottles are perfect Glass Water Bottles for their aesthetic table side presentation. 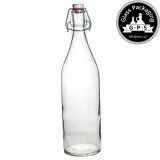 With a modern design, these Swing Top bottles are a welcome addition to any countertop or dining area.